In this post, I briefly summarize my experience of making cli4clj “GraalVM-ready”. Inspired by Jan Stepien’s talk about GraalVM at :clojureD 2019, I got curious about GraalVM. So, I gave it a try to build a “native” executable of the cli4clj example. The part of GraalVM that interested me, right now, was the capability to build native executables for JVM-based software. However, this post is not about introducing GraalVM. For more information about GraalVM, see, e.g., the GraalVM website or Jan’s blog post on Clojure with the GraalVM. Add type hints to avoid reflective calls. Downgrade Clojure from 1.10 to 1.9 as, currently, Clojure 1.10 does not work with GraalVM. Add a customized version of clojure.main/skip-whitespace, which adds type hints and removes the “readLine” case. Furthermore, there is still a minor lurking issue. The verbose exception printing, which is disabled by default, will not work yet as clojure.stacktrace/print-cause-trace is not “GraalVM friendly” yet. I did not address this aspect yet as it only concerns a minor use case and I wanted to experiment a bit first. In future, if GraalVM support proofs valuable, I will try to fix this. So far, I could run the generated executable on Fedora and in Windows with the Windows Subsystem for Linux using a Debian basis. Note that the reported system time is rather meaningless as the cli4clj example does not automatically terminate but waits at the command input prompt. So, the reported system time mainly depends on how quickly I pressed “q” for terminating the example application. The other reported values are not impacted that notably by this peculiarity. The start-up time of the native version is notably faster, which can also be observed in the reported user time and CPU usage. Furthermore, the memory footprint of the native version is less than a third of the Jar file counterpart. I uploaded a native build of the cli4clj example application and the corresponding standalone Jar to the cli4clj repository. Furthermore, now (starting with version 1.7.2), you can include cli4clj in your GraalVM-based command line applications. I hope you find this blog post and cli4clj useful. If you have constructive feedback please let me know. I just returned from the fantastic :clojureD 2019 conference. I also added the LaTeX files for the presentation to the master branch of the cli4clj repository. In addition, I uploaded the minimal-example source code and tests shown in the talk. If you want to try the example yourself, you can clone the clojured_2019 branch of the cli4clj repository and run the example via “lein run” (for the normal scrolling mode) and “lein run — alt” (for the alternate scrolling mode). Huge thanks to everyone (organizers, attendees, speakers, etc.) involved in :clojureD. It was an honour to get the opportunity to present cli4clj at :clojureD. I enjoyed the conference a lot and had a great time exchanging thoughts and ideas with the lovely community. In this post, I briefly introduce a newly added “alternate” scrolling mode for cli4clj, a library for easing the implementation of interactive command line interfaces (CLIs) for Clojure applications. Since quite some time, I had been a bit unhappy about how repeated and asynchronous output is handled for CLIs implemented with cli4clj. The main cause of the problem is that, simply speaking, everything (commands, command output, completion hints, user input, etc.) is printed into the same shell. This causes the situation that repeatedly printed asynchronous output interferes with user input. Which ultimately causes the problem that the interactive CLI can become hardly usable or completely unusable. Below, an animated gif illustrates the problem. and one for displaying completion hints and “special” output such as error messages. Below an example of the alternate scrolling mode is shown. The largest area at the top above the line is used for printing the “scrolling” output. Below the line, input can be entered at the usual prompt. Below the prompt, “special” output such as completion hints or errors are printed. The alternate scroll mode can be enabled by setting the key “:alternate-scrolling” to “true” in the cli4clj options map. Alternatively, a predicate function returning a Boolean value can be set. In addition, the height of the area underneath the prompt reserved for the special output can be adjusted by setting the “:alternate-height” key to a corresponding integer value. With the alternate scrolling, I am mostly scratching my own itch. However, I hope that some of you will also have good use cases for the alternate scrolling mode. I would be very happy to hear if cli4clj is helpful for you or if you have constructive comments or feedback. This year in February, I heard for the first time of A-Frame (at RWDSL@CGO). In a nutshell, A-Frame aims on easing web-based 3D visualisation. Based on my previous work involving Event-driven Architecture (EDA) and Message-oriented Middleware (MoM), I was curious if A-Frame could be used for visualizing near real-time data from EDA/MoM in a web browser. In this post, I briefly write about some very early experiments and how you can run them on your own. 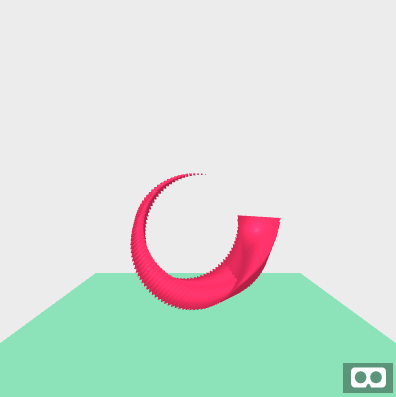 If everything works out, you should be able to see a simple 3D animation in your web browser. Thereby, the animated coordinates are calculated outside of your browser and sent to the browser via the MoM. Below the results are shown in two screenshots. 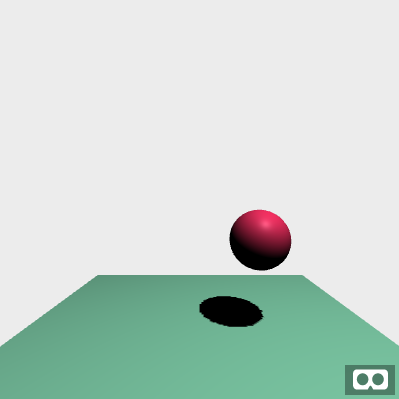 In the first screenshot, a simple sphere is used. In the second screenshot, I used a tetrahedron to which I added a “trail” to better visualize the animated movement. Note that I deliberately enabled shadows for the sphere example and disabled shadows for the tetrahedron-trail example. Alternatively, you can also find the web pages in the examples directory of the bowerick repository. In addition to the web pages, you need a MoM broker and an event/message producer for generating messages with the animated coordinates. To ease the use of this example, I included a corresponding event/message generator in bowerick. The example web pages use default settings for the broker URL and topic name that matches this simple setup of running the example on localhost. Thus, to see the animated visualization, you simply need to press the “Connect” button of the example web pages. For another example and as an outlook on a post I plan on more sophisticated event/message generation, you can try to run the bowerick event/message generation as shown below. As shown in the image underneath, this example plots a heart shape using a more complex mathematical function than the simple circle above (This is actually an Easter egg dedicated to family.). 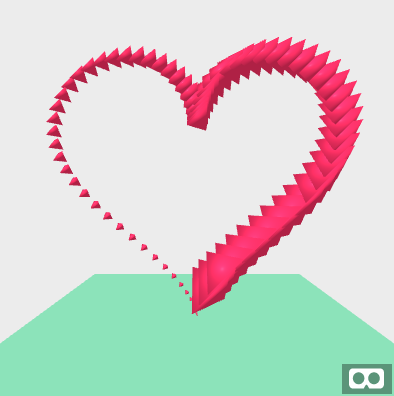 java -jar bowerick-2.2.2-standalone.jar -G heart4family -D /topic/aframe -u "[\"ws://127.0.0.1:1864\"]"
I hope you consider bowerick and this post useful. If you have constructive criticism and comments just let me know. I am very much looking forward to helpful feedback. In this post, I announce cli4clj version 1.3.2 and write a bit about the newly added functionality for creating embedded Command Line Interfaces (CLIs). For those unfamiliar with cli4clj: the aim of cli4clj is to ease the implementation of simple interactive CLIs for Clojure applications. The original and still primary focus of cli4clj is on implementing interactive CLIs intended to be used in interactive terminals/shells. However, in one of my other applications, I needed an interactive CLI that can be used via network, actually via a Message-oriented Middleware (MoM). The primary aspect in the CLI via network use case, from the cli4clj perspective, is that cli4clj leverages jline for handling interactive input from a terminal/shell. In the CLI via network use case, however, input cannot be read from an interactive terminal/shell. In the concrete scenario of using an MoM, I wanted to send commands via messages and receive the output via corresponding reply messages. Furthermore, I wanted to use the existing MoM infrastructure without the need of opening yet another socket. Hence, networked CLIs such as nREPL did not appear as a good match to me. Furthermore, I wanted to re-use the same map-based approach for configuring the jline-based CLI for the “embedded” CLI. The reason for this is that this will allow to easily switch between a jline-based and an embedded CLI or use both at the same time, e.g., when an application is intended to be used interactively in a terminal and, at the same time, the same functionality should be exposed via network. Moreover, I wanted to make the new “embedded” CLI generic such that it can also be used in other places. The embedded CLI functionality uses the map-based cli4clj configuration format and creates a “CLI-function” instead of an interactive input. The generated function accepts a string of commands and arguments as input and returns the string result of “executing” the provided input. Thereby, the string result is the output that was produced as a result of executing the supplied command and arguments string. Below, an example for using the embedded CLI functionality is shown. The example was executed in the cli4clj project in a “lein repl”. In order to illustrate that the output is really returned as string from the “CLI-function” I used the indirection of putting the results in the “ret” var and showed them by printing the value of “ret”. "ERROR: Invalid command: \"[bar]\". Please type \"help\" to get an overview of commands." "divide\n\n\nhelp [? h]\n\tShow help.\n\tDisplay a help text that lists all available commands including further detailed information about these commands.\n\nprint\n\n\nquit [q]\n\tQuit the CLI.\n\tTerminate and close the command line interface." Display a help text that lists all available commands including further detailed information about these commands. Terminate and close the command line interface. Besides adding the embedded CLI functionality, I also fixed some issues, as you can see in the version number. However, as things usually go with adding new functionality, even though it was tested and implemented following test-driven development, I likely added new bugs as well. So, whenever you spot a problem, just let me know. I hope cli4clj is useful for you. I am always happy about constructive feedback and comments. Added functionality for advanced message handling for message producers and consumers. Added a built-in test message/event producer for easing experiments and demonstrations. Updated version numbers from 1.99.x to 2.x.y. The addition of this functionality was inspired by a reply I got to an earlier post about bowerick. Thanks a lot to Evgeny (eaksenov) for the input. I hope that the new functionality is what you had in mind with your request. Up to now, bowerick message producers and consumers only considered the actual payload. For sending, a producer only accepted a single argument, the data/payload to be transmitted. Analogously, the callback called by consumers on message reception only accepted a single argument, the received data/payload. Advanced message handling now allows more sophisticated interaction when sending/receiving messages. Regarding the split between message producer and consumer, I consider the consumer part more complete by now. Thus, I will start the discussion with the consumer. With the new advanced message handling functionality, a bowerick consumer can now also accept a callback with two arguments. If a two argument callback is passed, the first argument will contain the same data/payload as for the single argument callback. The second argument, is an instance of either the received message or the message headers, depending on which wire format/protocol is used. For OpenWire, STOMP, and MQTT, the second callback argument is the received message instance. For STOMP via WebSockets (WS/STOMP), the second callback argument is the StompHeaders instance that was received along with the payload. Please note: while the OpenWire and STOMP messages both implement javax.jms.Message, the concrete implementations are different, e.g., ActiveMQBytesMessage respectively StompJmsBytesMessage when transmitting byte array data. Furthermore, the messages received via MQTT (org.eclipse.paho.client.mqttv3.MqttMessage) do not implement javax.jms.Message. For producers, the advanced message handling is in a rather early stage. So far, only setting custom message properties for OpenWire and STOMP is supported. In order to set message properties for OpenWire and STOMP messages, you have to pass a second argument to a producer instance in addition to the actual payload data. The additional argument is a map in which the message properties have to be associated to the :message-properties key. The message properties have to be defined as a map of string keys and arbitrary values. The string keys are the identifiers used for naming the message properties. What type of property, e.g., Boolean, Int, Double, etc., is used is determined based on the type of the corresponding value. Instead of hard-coding the identifier :message-properties, the var msg-prop-key from the bowerick.jms namespace can be used as key as well. Please note that MQTT and WS/STOMP producers also support the second argument. However, the second argument will be simply ignored for now for these protocols. For testing, experiments, and demonstration purposes, it can be beneficial to have some continuous traffic flowing across the messaging system. Thus, I added a simple built-in message/event producer for synthetically generating and sending messages. The new message/event producer generates message with 50 Hz. The messages contain x, y, and z coordinates of, say, a point. Currently, the z coordinate is constant and on the x/y plane the point follows a circular movement. This message/event producer is the basis for a demo, which I will cover in a separate post later. When running bowerick in daemon mode as broker, it provides some, currently very simple, management functionality. Previously, this functionality was implemented rather coarse such that it was not very user friendly and cumbersome to extent. The new online management functionality is based on new embedded CLI functionality, which I recently added to cli4clj. For this post, I will just go with the summary that this will help to improve usability and extendibility of the online management functionality. I will write more about this cli4clj embedded CLI feature in a dedicated future post. Since quite some time, I hade been using version numbers of 1.99.x. Originally, my intent for using the 1.99.x versions was that the release of the next major version, 2.x.y, was imminent. I “just wanted to implement that one big change” and then switch to 2.x.y. Unfortunately, I never really got around to implementing that change and was distracted by other more urgent or fun aspects. Thus, I did not really make it to get rid of that 1.99.x version. However, eventually, I got annoyed by this 1.99.x thing going on for so long. So, I finally decided to switch back to some more decent versioning and just do the jump to 2.x.y. In future, I may need to do another major version bump when the “big change” finally comes. However, so far, I think it is much easier to have a reasonable version scheme rather than continually going on with this 1.99.x stop gap solution. In this post, I announced the release of bowerick 2.1.0. Besides some technical details about new features etc. I also tried to provide some rationale for the new major version number. In addition, I somewhat teased you with an outlook on some more future posts. So, I actually owe you at least two more posts, right now. I hope you consider bowerick useful and am happy about your feedback and comments. As you could see in this post, sometimes, coming up with a feature request may actually lead pretty quickly to a corresponding implementation. As usual, I am very happy about any constructive feedback.